I'm a bit behind on this one, but I haven't seen anything in the blogosphere on USA Today's report that Army officials in Iraq have requested new armor be added on to the Mine Resistant Ambush Protection vehicles, which have taken on rock star status in Washington. The MRAPs V-shaped hulls protect soldiers from roadside bombs, but they can't defeat explosively formed projectiles. According to documents obtained by USA Today, U.S. officers in Iraq expect insurgents to start using a lot more EFPs when newly manufactured MRAPs start flowing into the war zone. It looks like the Army has already developed armor to defeat the EFPs, according to the newspaper report, which is excerpted below. "Ricocheting hull fragments, equipment debris and the penetrating slugs themselves shred vulnerable vehicle occupants who are in their path," said the document, which asks for 3,400 sets of add-on armor. The Army has tested armor that appears to protect MRAPs from the explosives, said Brig. Gen. Michael Brogan, who confirmed the document's authenticity. Brogan leads Marine Corps Systems Command, the lead agency for the MRAP program. "How rapidly we can engineer that onto these vehicles is yet to be seen because it is significantly heavy," he said. EFPs are explosives capped by a metal disk. The blast turns the disk into a high-speed slug that can penetrate armor. The Army's solution, Brogan said, involves armor that can fracture the slug. Lt. Col. William Wiggins, an Army spokesman, declined to comment specifically on the armor but released a statement that said the Army is developing "effective countermeasures" against the bombs. Philip Coyle, the Pentagon's former chief tester and a consultant in the NBC News investigation into Dragon Skin body armor, says he's not convinced by the Army's defense of its Interceptor system over the past few days. Coyle, a senior adviser at the Center for Defense Information, observed NBC News' side-by-side tests of Dragon Skin and Interceptor at a ballistics laboratory in Germany. He observed the tests pro bono after a request from NBC News. 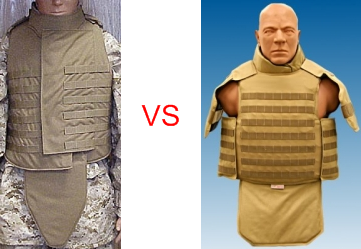 Coyle said in a telephone interview with Ares last night that the Army's PowerPoint slide was "misleading" in its comparison of body coverage between the Army's Interceptor and Dragon Skin manufactured by Pinnacle Armor. The Army banned soldiers from buying Dragon Skin last year. Coyle said he had his own private briefing of the Dragon Skin testing by one of Brig. Gen. Mark Brown's senior staff members and was told the Inteceptor's body coverage was compared to Dragon Skin without the plates that actually provide the protection. Brown heads the Army office charged with selecting body armor. What do you think? Care to weigh in? This video on Dragon Skin available on YouTube is from an episode of the Discovery Channel's "Future Weapons" program. 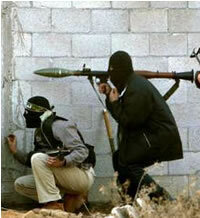 One of the biggest threats when fighting asymmetric wars against insurgents -- especially in urban environments -- is posed by the ubiquitous RPG-7 family of rocket-propelled anti-armor weapons. The Netherlands-based TNO Defense, Security and Safety research lab is developing a deceptively simple protection system against RPG-7 attacks: a net. Specially-designed, specifically-dimensioned, X-knotted and manufactured from advanced superstrong fibers, sure. But still "just" a net. 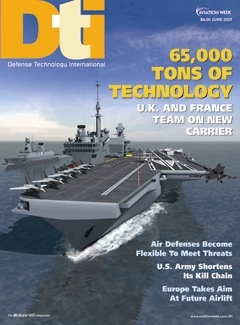 Nevertheless, TNO claims it has the potential to provide armored vehicles with 90% protection against these deadly missiles, at little cost and almost no extra weight on the vehicle. Click below to read the rest of the post and watch two videos. InsideDefense.com is reporting that Defense Secretary Robert Gates wants to get to the bottom of any and all obstacles to increased production of the Mine Resistant Ambush Protection family of vehicles. In a memo obtained by Jason Sherman at InsideDefense.com (subscription required), Gates designates the MRAP as the "highest priority" acquisition program. 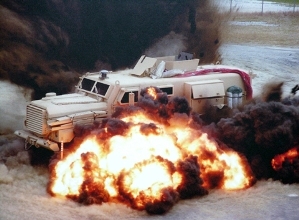 The relatively new MRAP program has been a darling of the media, Congress and military officials recently, mostly because its unique V-shaped hull deflects fragments from roadside bombs and improvised explosive devices, and because no soldier or Marine has died in one. The Army has a new combat shirt, unveiled this week. 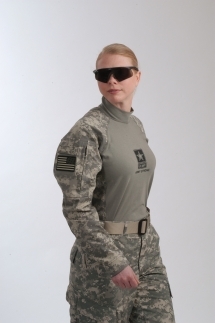 When combined with the Army's combat pants and combat gloves, the clothing offers head-to-toe protection against burns, according to the program executive office soldier. The flame-resistant long-sleeved shirt, which retains the moisture-wicking capability, breathability, and durability of other components in the ACU, also has many of its other features, including cargo pockets, infrared identification tabs, and hook-and-loop fasteners for the American flag. Visit an Australian Army checkpoint in East Timor below. Norway is ordering 8,200 new HK416 assault rifles with a caliber of 5.56 x 45 mm from German-based Heckler & Koch. The new rifles are to replace the obsolete AG-3 rifles (caliber: 7.62-mm) that have been the standard rifle in the Norwegian armed forces since the 1960s. The AG-3 is so old that it has been out of production since 33 years, the Norwegian defense ministry says.